Mr. Duffy is a litigator in Dykema’s Detroit office and a member of the Business Litigation group. While in law school, Mr. Duffy distinguished himself inside and outside the classroom. Mr. Duffy graduated first in his class and completed federal judicial internships for judges on the United States Court of Appeals for the Sixth Circuit and the United States District Court for the Eastern District of Michigan. A dedicated member of Wayne State’s Mock Trial team, Mr. Duffy won the program’s intra-school competition in 2016 and competed in national competitions sponsored by the American Association for Justice, the Texas Young Lawyer’s Association, and the National Institute for Trial Advocacy. He even helped train the next class of Mock Trial advocates by coordinating a trial skills workshop for more than 30 law students. 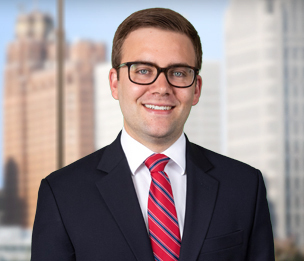 Besides honing his trial skills, Mr. Duffy gained valuable experience developing his research and analytical prowess during two years on The Wayne Law Review. Before law school, Mr. Duffy served as Campaign Manager in hotly contested races for the State House of Representatives in Michigan, leading winning campaigns at the primary and general election stages. He also spent several years on the staff of state Representative Tom Cochran where he advised on policy matters and delivered solutions to constituent problems on a wide range of issues, including licensing and access to public services. In his pro bono practice, Mr. Duffy focuses on defending tenants in eviction proceedings to protect them from wrongful evictions and negotiate appropriate compromises with landlords.